I hope everyone had a great long weekend and happy Easter. For me, it meant some serious family feasts. 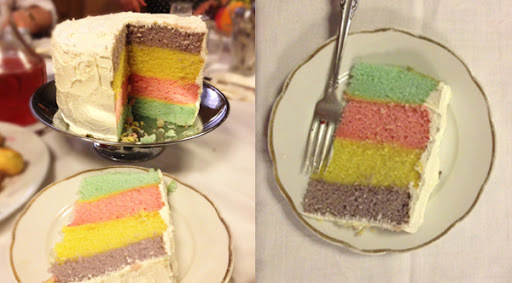 I decided I was going to bring back my popular multi-colour cake. Last time I did ombre with shades of pink for a girlfriend’s birthday. It was such a success (and so very impressive) so I decided to give it an Easter twist and use four completely different pastel colours. The wow factor didn’t fail with cameras coming out when I cut that baby up. So if you’re looking fame when it comes to your baking, I highly recommend giving it a shot. I admit that I used some short cuts but you could do it all from scratch if you’re a baker extraordinaire. While the cakes are in the oven, whip up the lemon pudding. Once the cakes are done, take a long knife and cut off the tops to make them flat for stacking. Then lastly, cover the cake with a layer of delicious cream cheese icing (or whip cream if you prefer) and then, voila! you’re done until you cut it up in front of everyone. They will think it’s magic.